Scientists have been searching for sources of cosmic rays for more than a century. Neutrinos are nearly massless subatomic particles that have no electric charge and therefore interact rarely with their surroundings. Indeed, trillions of these "ghost particles" stream through your body unnoticed and unhindered every second. Observations by the IceCube Neutrino Observatory at the South Pole and a host of other instruments allowed researchers to track one cosmic neutrino to a distant blazar, a huge elliptical galaxy with a fast-spinning supermassive black hole at its heart. And there's more. Cosmic neutrinos go hand in hand with cosmic rays, highly energetic charged particles that slam into our planet continuously. So, the new find pegs blazars as accelerators of at least some of the fastest-moving cosmic rays as well. Astronomers have wondered about this since cosmic rays were first discovered, way back in 1912. But they've been thwarted by the particles' charged nature, which dictates that cosmic rays get tugged this way and that by various objects as they zoom through space. Success finally came from using the straight-line journey of a fellow-traveler ghost particle. IceCube, which is managed by the U.S. National Science Foundation (NSF), is a dedicated neutrino hunter. The facility consists of 86 cables, which nestle within boreholes that extend about 1.5 miles (2.5 kilometers) into the Antarctic ice. Every cable, in turn, holds 60 basketball-size "digital optical modules," which are outfitted with sensitive light detectors. These detectors are designed to pick up the characteristic blue light emitted after a neutrino interacts with an atomic nucleus. (This light is thrown off by a secondary particle created by the interaction. And in case you were wondering: All that overlying ice prevents particles other than neutrinos from reaching the detectors and dirtying up the data.) These are rare events; IceCube spots just a couple of hundred neutrinos per year, Halzen said. The facility has already made big contributions to astronomy. In 2013, for example, IceCube made the first-ever confirmed detection of neutrinos from beyond the Milky Way galaxy. Researchers weren't able to pin down the source of those high-energy ghost particles at the time. On Sept. 22, 2017, however, IceCube picked up another cosmic neutrino. It was extremely energetic, packing about 300 teraelectron volts — nearly 50 times greater than the energy of the protons cycling through Earth's most powerful particle accelerator, the Large Hadron Collider. Within 1 minute of the detection, the facility sent out an automatic notification, alerting other astronomers to the find and relaying coordinates to the patch of sky that seemed to house the particle's source. The community responded: Nearly 20 telescopes on the ground and in space scoured that patch across the electromagnetic spectrum, from low-energy radio waves to high-energy gamma-rays. The combined observations traced the neutrino's origin to an already-known blazar called TXS 0506+056, which lies about 4 billion light-years from Earth. 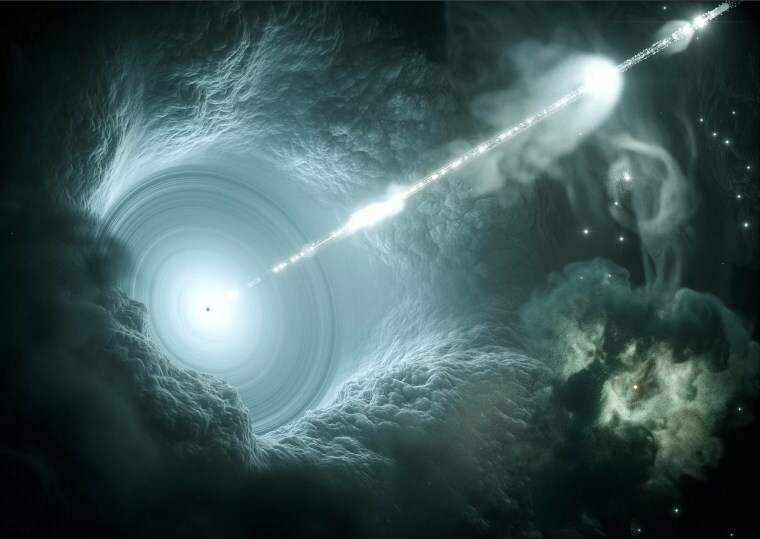 The IceCube team also went through its archival data and found more than a dozen other cosmic neutrinos that seemed to be coming from the same blazar. These additional particles were picked up by the detectors from late 2014 through early 2015. "All the pieces fit together," Albrecht Karle, a senior IceCube scientist and UW-Madison physics professor, said in a statement. "The neutrino flare in our archival data became independent confirmation. Together with observations from the other observatories, it is compelling evidence for this blazar to be a source of extremely energetic neutrinos, and thus high-energy cosmic rays." The findings are reported in two new studies published online today (July 12) in the journal Science. You can find them here and here. Astronomers have identified several thousand blazars throughout the universe, none of which have yet been found to be slinging neutrinos at us like TXS 0506+056 is. "There's something special about this source, and we have to figure out what it is," Halzen told Space.com. That's just one of many questions raised by the new results. For example, Halzen would also like to know the acceleration mechanism: How, exactly, do blazars get neutrinos and cosmic rays up to such tremendous speeds? Halzen expressed optimism about answering such questions in the relatively near future, citing the power of "multimessenger astrophysics" — the use of at least two different types of signals to interrogate the cosmos — on display in the two new studies. The neutrino discovery follows closely on the heels of another multimessenger landmark: In October 2017, researchers announced that they had analyzed a collision between two superdense neutron stars by observing both the electromagnetic radiation and gravitational waves emitted during the dramatic event. "The era of multimessenger astrophysics is here," NSF Director France Cordova said in the same statement. "Each messenger — from electromagnetic radiation, gravitational waves and now neutrinos — gives us a more complete understanding of the universe and important new insights into the most powerful objects and events in the sky." WANT MORE STORIES ABOUT ASTROPHYSICS?